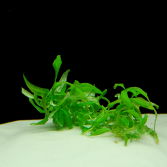 This variety of Hygrophila polysperma is very hard, and grows even faster than the standard variety. It forms beautiful light green and brown leaves, which are about 30% longer than standard. It also grows bushier than the standard variety. It is suitable for all aquaria; it does not requre large amounts of light, but grows its prettiest with medium light, fertilization, and CO2 (but this will also cause it to grow very quickly). CO2 is definitely NOT required to grow this plant.